We’d love your help. Let us know what’s wrong with this preview of By Design by Ralph Caplan. To ask other readers questions about By Design, please sign up. Caplan covers a lot of territory and makes some interesting observations, such as when he takes up what I assume to be a common topic in the design world of how different or alike is design and art. There is a depressing way to account fo Caplan covers a lot of territory and makes some interesting observations, such as when he takes up what I assume to be a common topic in the design world of how different or alike is design and art. Interesting, right? But to the purpose of the book, here are two quotes that I think encapsulate Caplan’s view of what life is all about and how design is part of it, which unfortunately includes a quoted endorsement of circuses of which I have a congenital aversion to. Although a different tone and a flashier style he seems to be similar to or at least in harmony with the Bill Stumpf book ( https://www.goodreads.com/review/show... ) and now that I look at my review of that other book the similarities are more apparent. Both tie the design process to the structure of civilization. In fact in By Design Caplan has this nice part that I found particularly insightful. I used that to go off on a tangent in my own mind to consider that it is in fact the idea of civilization that separates just surviving from being part of something involving an active and enriching encounter between humans. I suppose that is sort of the definition of civilization so I guess I meant to say...people confuse survival as a species to an actual civilization and "civilization" requires observation, sensitivity and planning. Basically design. Along these lines Caplan tries to claim that in the history of design the tasks of designers has changed from creating objects to designing “possibilities” which is a much more open process as opposed to an object to worked upon. But even though this is book about design, I think there is one small section that applies to all areas of life. This simple condensation on how to approach any design problem would be a godsend to any business meeting or if applied to personal relationships would save us from so much stress if not even save lives. Think about it, at any point of any conflict everybody stopped to examine what materials are involved, who it will affect and what might they need. And if there is a problem what might a solution look like. This book is a must-read for any designer (print, web, industrial, whatever) that thinks he or she has it all figured out. There's a lot of well deserved smack-down for designers in this book. On one end of the spectrum, we have folks who claim to design things when they are only stylizing them; on the other end, we have folks who shed all style in favor of functionality. 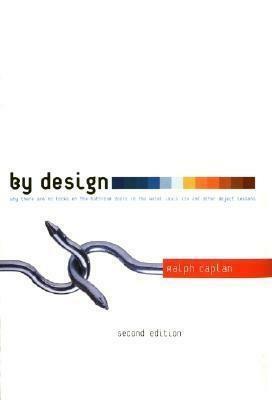 Both earn well-deserved smacks from Caplan (even Bauhaus designers are smacked around in this book, and yes, they, too, deser This book is a must-read for any designer (print, web, industrial, whatever) that thinks he or she has it all figured out. There's a lot of well deserved smack-down for designers in this book. On one end of the spectrum, we have folks who claim to design things when they are only stylizing them; on the other end, we have folks who shed all style in favor of functionality. Both earn well-deserved smacks from Caplan (even Bauhaus designers are smacked around in this book, and yes, they, too, deserve it). Funny and well researched book on design both for designers and non-designers alike. The more you know design and design history, the more you will be appalled by its depth - lots of complex and non-obvious stuff is told in the passing. I started reading this book to explore my own inclination to find much talk about "design" from "design enthusiasts" as irritating, snobby, and elitist. Isn't everything made by humans designed? If so, what makes an Eames chair any better than any other kind of chair? Aren't all of these things subjective, not objective? Spoiler: This book did not inspire me to become a design enthusiast, and I still struggle with all of these questions, as well as a few other new ones. That said, it was a general I started reading this book to explore my own inclination to find much talk about "design" from "design enthusiasts" as irritating, snobby, and elitist. Isn't everything made by humans designed? If so, what makes an Eames chair any better than any other kind of chair? Aren't all of these things subjective, not objective? That said, it was a generally interesting read, though I disagree with many of its points. I was a bit frustrated by the fact that in Caplan's meandering style, he would bring up some really intriguing point--and then immediately move on to something else. Clearly he has a lot to offer, but he didn't always seem disciplined enough to focus in on even his own points. Очень специальная книга, сборник статей/эссе на разные темы, попытка понять, что же такое дизайн и где его место в мире. Ещё одна из книг, которые я давно хотел прочитать, как, наверное, это видно, основа этого желания лежит в давнишнем увлечением ЖЖ Артемия Лебедева. Тот случай, когда увлечение прошло, а желание, как и интерес к этой области деятельности, не угасли. Книга отличная, насыщенная не только точными жизненными наблюдениями, но и перспективой. В конце книги автор говорит о том, что все знают, что делать и главный вопрос для него, на который он не знает ответа, это как. Но дело в том, что мне, читателю, н Ещё одна из книг, которые я давно хотел прочитать, как, наверное, это видно, основа этого желания лежит в давнишнем увлечением ЖЖ Артемия Лебедева. Тот случай, когда увлечение прошло, а желание, как и интерес к этой области деятельности, не угасли. Fascinating and engaging book, one of those rare ones I've read that makes me view the world differently afterward. In a nutshell, this serves as a great introductory answer to the question "Why does design matter?" I didn't fully grasp why and wasn't that interested in the subject, which is why I especially appreciated the auther's embrace of the idea "a subject important enough to warrant a large book should be introduced by a short one." This is a fairly short book (though that doesn't mean i Fascinating and engaging book, one of those rare ones I've read that makes me view the world differently afterward. In a nutshell, this serves as a great introductory answer to the question "Why does design matter?" I didn't fully grasp why and wasn't that interested in the subject, which is why I especially appreciated the auther's embrace of the idea "a subject important enough to warrant a large book should be introduced by a short one." This is a fairly short book (though that doesn't mean it goes quickly - there's much to chew on). 1. How often products/solutions are created to overcome design flaws in other products (!). For instance, non-slip pads for bathtubs - if the bathtub was better designed, such a pad would not be needed. 2. The proposition that one way to define being physically disabled is when someone is incapable of compensating for inadequate design. Put another way, the world is full of products and environments that work only because humans can adjust to them (chairs or entranceways, for instance). When someone's body cannot make the necessary adjustments, they are "disabled." The chapter on Ray and Charles Eames is a pleasure to read by itself. I plan to read more about them, and was delighted to see that their film experiments are available on Netflix. Seriously! Why isn't this book famous yet? It's a brilliant work for the very thing enthusiastic designers look for - What was the problem and how did one solve it? By Design is a book that practices humility - something that most designers loose their hold on. 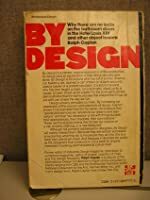 After a long time, I finally found a book that preached Dieter Ram's philosophy for good design while balancing Christopher Alexander's idea of honest design. And I truly loved the idea of 'handicapped design' that got coined in this book. Seriously! Why isn't this book famous yet? It's a brilliant work for the very thing enthusiastic designers look for - What was the problem and how did one solve it? By Design is a book that practices humility - something that most designers loose their hold on. After a long time, I finally found a book that preached Dieter Ram's philosophy for good design while balancing Christopher Alexander's idea of honest design. And I truly loved the idea of 'handicapped design' that got coined in this book. To all sesigners that have been bogged down by ridiculous 'lets-also-do's from PMs and POs, I assure you fellas that you'll be grinning around your head at that point in the book. Ralph Caplan can flat out WRITE. I've read articles of his before, and he has a true talent of making the ordinary seem extraordinary. Caplan could write a book about a turd and make it into a "I couldn't put it down" kind of book. I am not in the least interested in "design" and such; in fact, ordinarily, no subject would bore me more. But Caplan is such a gifted writer with such a great dry sense of humor, I absolutely loved the book. I attempted to read this book and stopped because it seemed to filled with incoherent ranting. I may have been distracted when reading it though, so I'll give it another shot in the future. For now though, I have to give it 1 Star.